During the last 18 months I have made two trips to Russia, the first in August of 2006 and the second in June of 2007, spending a total of 6 weeks there. Now fluent in Russian, it was simply astonishing to note the level of progress Russia made during this brief period. Simple things ranging from painting crosswalk markings on key streets for pedestrians, passing laws making dog owners responsible for their pets, a marked reduction in public drunkenness and overall improved security. Clearly, glaring problems do still exist, especially in rural areas, yet it is not hard to see why Putin has been so popular. In addition there is a vast untapped pool of workers in the 30-50 year old range who are seriously underemployed. Younger Russians are however now very optimistic regarding their future. The task for Russia’s new leader will be to push prosperity out of St. Petersburg and Moscow into rural areas, in particular by providing tax free industrial development zones to stimulate necessary job creation, etc. A hefty sales tax on luxury goods might also be popular given the dramatic disperity between ordinary workers and high net worth Russians. It is rather shocking to see the level of new arrogance and extreme insensitivity many wealthy Russians now display toward their fellow less economically fortunate citizens. 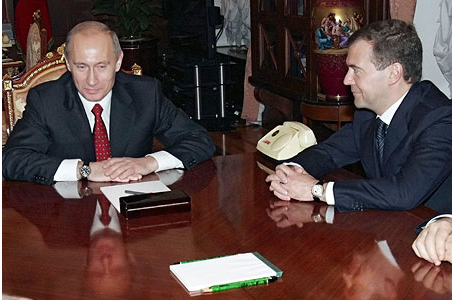 Now that Putin has designated 42 year old Gazprom Chairman Dmitry Medvedev to success him, it would also seem natural for him to return to St. Petersburg and lead the organization that is economically defining Russia’s future, Gazprom. My guess is that part of this role will be to initiate the sale of energy in rubles with the goal of making the ruble one of the global economy’s key reserve currencies. A proposterous idea a few years ago could indeed be an upcoming reality. For the United States it is about time that we realize Russia should be a key ally and cease the current sword rattling, even though we still have a significant philisophical divide to negotiate. The investment community in particular needs to get over the nationalization of Yukos and the complete loss to investors. Ironically, that loss could turn out to be a great investment in that it will spawn many more investment opportunities resulting from a stronger and more secure Russia resulting from plowing the nationalized Yukos assets and energy wealth back into the country to fund government services and necessary infrastructure.